CLEVELAND (AP) — The Indians swung a wrecking ball at their roster this offseason. With a frugal eye on their future, the three-time defending AL Central champions slashed payroll by nearly $20 million while letting core championship players like All-Star outfielder Michael Brantley, franchise career saves leader Cody Allen, reliever Andrew Miller and others leave as free agents while trading slugger Edwin Encarnacion, catcher Yan Gomes and first baseman Yonder Alonso. Josh Donaldson, last year’s major trading deadline acquisition, is another of the departed. The massive overhaul was stunning for one of baseball’s most consistent organizations, rocking a frustrated fan base teased by previous deep postseason runs. The Indians needed to close the gap on Houston, New York and Boston in the AL. Instead, they seemed to widen it. 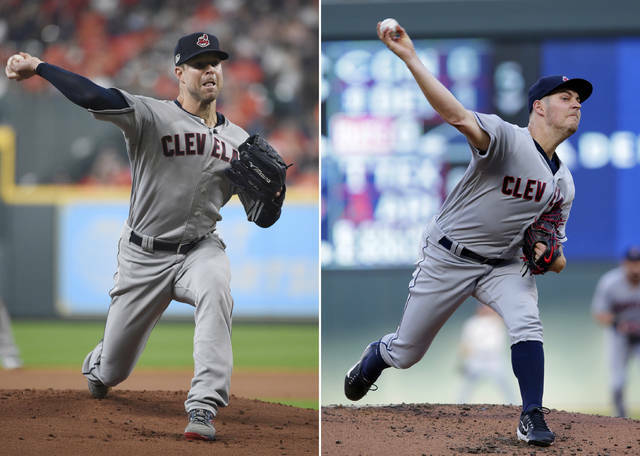 And while the Indians made numerous moves, they didn’t pull the trigger on a blockbuster trade involving All-Star pitchers Corey Kluber or Trevor Bauer. The pair were linked to trade rumors for months, but they’re still around and unless Cleveland gets blown away with a package that will make them better immediately, it’s likely Kluber and Bauer will stay put and anchor the strong starting staff. Given all their talent, the Indians somewhat underachieved in going 91-71 last season — their sixth straight winning season under manager Terry Francona — and then had another disappointing playoff performance as they were swept by the Astros. Cleveland’s window to win its first World Series title since 1948 could be closing quickly, and a division crown is far from guaranteed with both Minnesota and Chicago expected to be vastly improved. Here are some other things to watch this spring in Goodyear, Arizona, where the Indians will have their first full-squad workout on Feb. 18. Cleveland did make one major offseason acquisition, and it was a familiar one as first baseman Carlos Santana returned after one season in Philadelphia. He came back in the three-team trade that also netted the Indians first baseman Jake Bauers, a promising 23-year-old who can also play in the outfield. Santana’s presence in the lineup is vital to protect All-Stars Francisco Lindor and Jose Ramirez, who combined to hit 77 home runs last season and became the first teammates with at least 80 extra-bases hits in consecutive years since Lou Gehrig and Joe DiMaggio (1936-37). The Indians outfield is unsettled and could remain in flux for a few months. Brantley’s departure has created an enormous hole in left and inside the clubhouse as the three-time All-Star provided leadership and consummate professionalism. Leonys Martin has fully recovered after his serious health scare and could move in permanently in center. Bradley Zimmer’s recovery from shoulder surgery has gone well and he could have a major impact if he can cut down on his strikeouts. Bauers, Greg Allen, Tyler Naquin and Jordan Luplow are also in the mix for Francona, who could initially platoon at all three outfield spots. Triston McKenzie could be the next great right-hander to emerge from Cleveland’s rich pitching pipeline. The 21-year-old will likely begin the season at Triple-A Columbus, but it’s possible he’ll be in the Indians’ bullpen at some point this season. The 6-foot-5 McKenzie struck out 186 in just 143 innings in 2017 at Carolina (Class A). With Kluber, Bauer, Clevinger, Carlos Carrasco and Shane Bieber, the Indians have arguably baseball’s deepest rotation. Cleveland became the first team in history to have four pitchers record 200 strikeouts in the same season, and Bieber’s ascension (11-5 in 19 starts) as a rookie last season is one of the main reasons the club has considered dealing one of its aces. Once strong, the Indians’ bullpen has lost some major muscle. Although he struggled last season, Allen was one of the game’s steadiest closers and Miller’s dominance in 2016 carried the Indians within a swing of winning the series. All-Star left-hander Brad Hand, who came over last July in a trade from San Diego, will slide into Allen’s spot. Steady set-up men Dan Otero and Oliver Perez are also back. After that, nothing is certain and the Indians are hoping Danny Salazar, Cody Anderson and Nick Goody can all return from injuries and contribute. ON DECK: The Indians host the 75th All-Star Game in July, and before that they’ll open the regular season on March 28 in balmy Minneapolis.